Here's what weeks 42 and 43 looked like! We treated my sister-in-law to a belated birthday lunch at the Tosa Urban Beets. Unfortunately, our nephew ate tree nuts there and had a bad reaction, so this day didn't end too happily for my sister-in-law. I ordered the Sunrise Sammie and it was so good! I also had the Blue Majik smoothie bowl. I had been wanting to try it since I saw it on their menu and I was so glad I did. I got through most of this book but decided to abandon it today with about a hundred pages to go until the end. The book could have been half the size. Checked out Goddess and the Baker at the Corners in Brookfield with Danielle. We both loved our meals and dessert! I'm so happy the Corners finally has a coffee shop. I was so happy to see a great selection of vegan desserts on their menu. This chocolate cupcake was as delicious as it looks! What a pretty corner to have coffee in! I decided I need to spend a day off of work here with a good book and a big cup of coffee. The green juice I ordered was so tropical and colorful! Love waking up to sunrises like this. These two love hanging out in our bedroom since it's normally off limits (we don't let the cats sleep with us). Shiva is always preventing me from reading. I wanted to share a random act of kindness story for the week. A stranger came up to my mom in the grocery store with this bouquet of fall flowers. She told my mom it was for her and she purchased flowers for a stranger every Friday. What a nice gesture and it made my mom's day! Little did that stranger know my mom has been having a rough couple of weeks with my dad being sick. I started this book today and it's pretty good so far! I love memoirs and heard about this one randomly somewhere. I'm hoping it is a quick read because I have a 600 plus page book to get through for book club next. Craig and I recently went on a wonderful vacation to the Portland, Oregon area. Both of us had never been to Oregon before, so it was fun to explore somewhere completely brand new. If you've never been, I highly recommend going as there is so much to do, people are friendly, and the food is amazing! Our view of Mt. Hood as we arrived was spectacular! We arrived on Tuesday, September 25th and stayed at the Holiday Inn Express & Suites Portland Airport - Cascade Station. We found our shuttle driver to be super friendly, the room was a nice size, the hotel was brand new, I loved the gym, breakfast was wonderful, and the location next to the tram station, and a strip mall with Target and restaurants was perfect. The next morning, we purchased Tri-Met public transit tickets and lined up for our train ride into the city. After dropping our bags at our next hotel, we wandered around the city a bit. Of course, we saw a"weird" and oh so Portland vehicle within the first hour of being there. Mid-morning, we were happy to get a phone call that our hotel room was ready for us! We spent two nights in the Pearl District at the Hampton Inn & Suites Portand- Pearl District. It was a new and modern hotel in a great location for city exploration. Our room was small but totally fine since we hardly spent any time there. I loved the art in the hotel lobby. These two pieces would look great in our home! I'd love one of these paintings too. I researched and bookmarked vegan restaurants before we left. Rabbits Cafe kept coming up on so many lists and Instagram posts. Our first lunch in the city was at the US Bank tower location. Craig ordered the Mini-Barbecue bowl which had Barbecue Soy Curls and Kale in Tahini Dressing Over Brown Basmati Rice. It was topped with Corn, Banana Peppers, and Nacho-Ranch Sauce. Keep in mind my husband never eats kale, but he loved his meal and is still talking about it a month later! 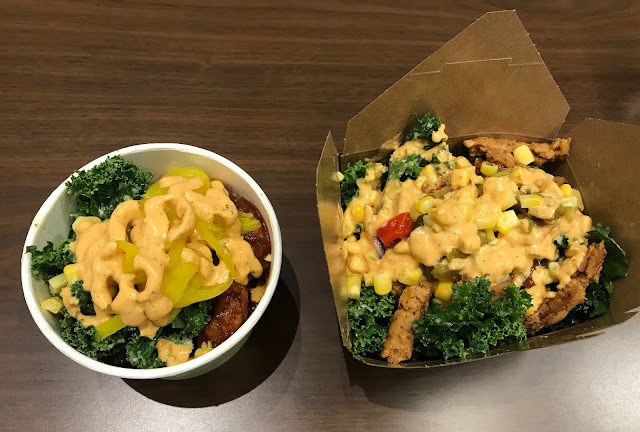 I enjoyed the Zia salad which featured Barbecue Soy Curls, Black Beans, New Mexico Green Chile, Corn, and Nacho-Ranch Sauce over Kale in Tahini Dressing. I had never tried soy curls before and they were so good. Yum! And to think, this was just the first of many excellent vegan meals we had on our trip. After exploring the city a bit more, we took the wonderful public transit system (light rail train and bus) west towards the hills. The city bus we took dropped us off at the bottom of a beautiful trail at the start of Washington Park. The International Rose Test Garden was amazing and huge! I loved this pink and yellow rose best. It smelled so beautiful there. That smile says it all. 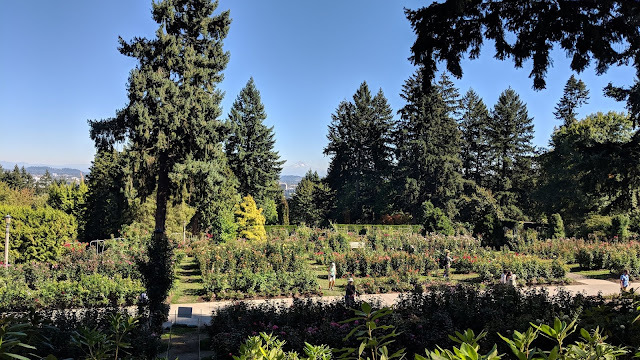 I loved exploring the gardens. The view of Mt. Hood from the rose garden was perfect! 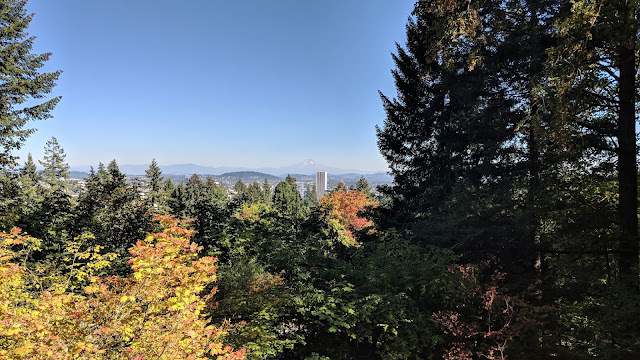 Our next stop was the Portland Japanese Garden just a short walk up the hill, where we met up with an friend of mine I hadn't seen in over 10 years. Janelle and I met in Italian language class in Oakland, California. She was one of my only good friends in California and we picked up right where we left off. It was so great to meet her energetic and adorable son, Nathaniel too! Janelle drove us around the city a bit before taking us back to our hotel. We checked out the rooftop of our hotel and experienced a great view of the sunset. Later that night, we ventured out to check out the enormous Powell's City of Books. Did you know it's the world's largest independent bookstore? I've been a big reader since I was a kid. Needless to say, I was in heaven. What a great first day in Portland! More posts on our adventures to come!